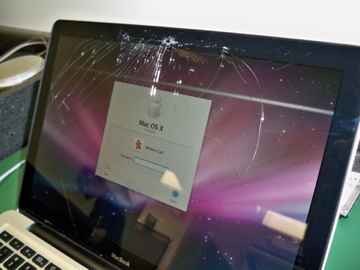 MacBook Retina Screen repairs – new lower price! Hello there, it’s a pleasant morning here at the Mission Repair base. Today we announced new lower pricing on MacBook Retina Screen replacements – and we are getting them in and out of our repair center in record time. Have you ever seen one of these displays? I know that most of you aren’t really concerned with the technology behind these products much, and that’s understandable. But look at the width of this 15″ LCD. This is the glass and LCD that displays the image on a 15″ MacBook Pro Retina Display. I mean, this thing is THIN! When I stood this up on the table, it was wobbling and flopping all over the place. It might not have helped that this was a broken screen that was already removed from a customer’s unit, but heck it’s just amazing to me that technology has come so far. In fact, in the very recent past, these screens were about 1/4″ thick. A “clunky” screen by today’s standards…and I’m talking about just 3 years ago! So there’s an art to these repairs and we’ve got it solved. Not only that, we’ve lowered our price as we have found a better supplier and are buying in much larger bulk so that means price decreases for our customers and money savings. Questions? I have customer service representatives standing by. 866-638-8402. Whoa there! Need a MacBook Unibody Glass Replacement? MacBook Unibody 13″ Glass Replacement $129. MacBook Unibody 14″ Glass Replacement $139. MacBook Unibody 15″ Glass Replacement $149. What does this include? Well, everything. This is parts, labor and 1 year warranty all rolled up into a very neat and inexpensive package. How do we do it? We’re the best in the business at this repair and our technicians are experienced and fantastic. You might be asking ‘What about a warranty”? Well no problem, we give you a full 1 year warranty with each of these repairs. There it is. The best price in the world from the Award Winning Apple Repair site, www.missionrepair.com.